Last night I was downtown returning some rentals when I ran into this man. His name is Sean Winters. I grabbed some "Sun of the East" tea from serious coffee and went to hang out on the corner which Sean was playing his saxaphone on. It was cold, of course, but he was still hitting all the notes and playing with some serious soul. It's a tough life; the busking life. I've tried it a few times with my guitar, but I was in no way as motivated as Sean. This is what he does every day of the week. Yes, you read right. Every. Day. 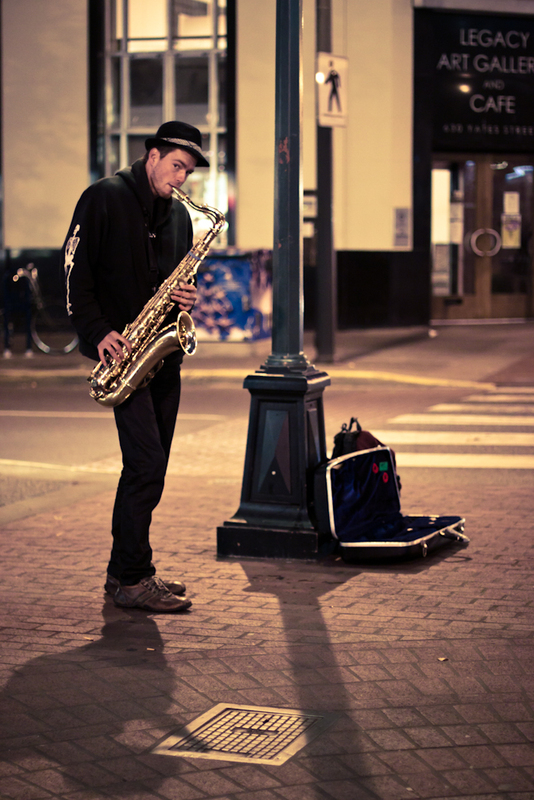 Playing the Sax is what he lives for and standing on the corner of city blocks doesn't seem to be a burden for him. Instead, from his awesome vibes, you can tell he's having fun. It's people like Sean that inspire me tremendously to do what I love. I'm sure some of you out there recognize him - so pay him a visit some time. Grab something warm to drink and enjoy a phenomenal show; he would be more than happy to play a few tunes for you - I promise.